Whether you’re relocating abroad to start a new life with your family, are off to study in another country, or are simply indulging in a well-deserved extended holiday – you’ll need an easy way to transport all of your personal luggage from A to B. In years gone by, shipping unaccompanied baggage anywhere in the world used to prove to be an expensive nightmare. Thankfully, shipping companies such as DHL and My Baggage offer an alternative to traditional methods of luggage transportation, such as airline baggage when travelling and traditional international removals when relocating. You can ship your luggage all over the world with DHL directly. It is a great way to ship your baggage overseas. However, booking with DHL directly can cost a pretty penny. When you book with My Baggage, you could make significant savings on your luggage shipment. In fact, our prices can be up to 80% cheaper than using a traditional courier company such as DHL directly. We offer fantastic low rates within the UK and worldwide, with shipping from as little as £16.99 within the UK, £79 to the USA, £91 to Canada, and £120 to Australia. We ship to over 200 countries worldwide, across over 1,000 routes. What’s more, My Baggage isn’t just affordable. Our luggage shipping service offers fantastic value for money. We offer a huge 30kg/66lbs weight allowance per box or suitcase. You can also pay for extra, and you can send as many items as you like. With our convenient and low-cost door to door luggage shipping services, My Baggage can offer a more feasible method of getting all of your baggage from point A to point B. 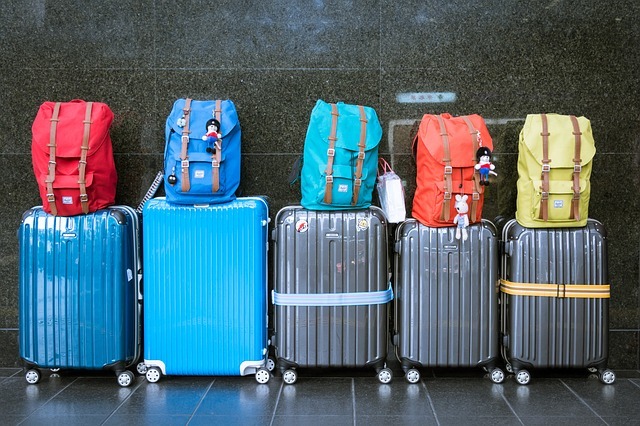 Our generous baggage weight allowance and the ability to send as many items as you like can come in particularly useful – our services allow you to bring more personal possessions with you than if you were simply relying on a few checked pieces of luggage. My Baggage is open to everyone, not just restricted to students. You can send to and from any address, you do not have to send to student accommodation. So, whether you’re off on a year abroad, travelling for work or leisure, or even relocating – we can help you. We at My Baggage understand that when it comes to your personal luggage, it’s only natural to feel some apprehension about handing everything over to a delivery driver. That’s why we strive to provide an international luggage shipping service that you know you can trust. Our door to door collection and delivery service provides the ultimate convenience – you can arrange everything from the comfort of your own home, there’s no need to drop your items off at a drop-off point, nor will you need to collect them from a pick-up point at the other side. We take care of everything for you. We will collect your items from your front door and deliver straight to where they need to go. As well, you will be kept up to date on the status of your shipment from the moment you place your booking until the moment your luggage arrives safely with you. You will be given access to a live tracking system, allowing you to keep an eye on shipment every single step of the way. You’ll also be able to opt-in for SMS and email notifications. If you have any questions or concerns along the way, our dedicated support team will be on hand to help. Thanks to many years of experience in logistics, they are experts in shipping excess baggage all over the world. Contact us via phone, email or live chat. Booking with My Baggage couldn’t be easier! Our easy to use online booking system is available 24/7 and takes just a few short moments to complete. You can simply start by obtaining a quote straight from our homepage. Once you’ve booked, we’ll send you some shipping labels to print and attach to your shipment. Then, you can sit back and relax as we take care of the rest. We’ll collect your shipment and deliver it to where it needs to go.